Really? Now maybe it's cause I've only ever worked in the ER, but I routinely do things that the techs normally do; not just cause Kaiser is too cheap to hire a reasonable amount of techs (i.e two techs for 40 - 50 patients) I do these things when I can and when the outcome is possibly a better patient relationship due to the more efficient delivery of care. I've seen many patients role their eyes and talk sh-t about an MD who left the room saying I'll get your nurse in response to them asking the doc if they could turn the "lights down" or "have another blanket" (when the resolution is 3 - 5 feet away). Not only is this kind of behavior rude and inconsiderate, it's actually counterproductive and, ultimately, self-defeating. Moving to OR, what ER to work at? Sorry to comment on a dead thread but... It's easy to disbelieve this based upon the massive publicity over the past few years but all Kaiser's are non-profit. Source: I work for Kaiser. Well done. That's good researching. I just wish this very basic information was more transparent; even in the late 90s, you could go to barnes & noble and pretty much figure all this kind of stuff out about most colleges/universities in about 30 minutes. Perhaps, it's because of the glut of online programs and online advertisements that pretend to be full of information until you realize it's some sort of blogsvertisement; or because you live in a state like CA where the tuition is changing practically every semester for CSU and UC schools and/or programs are getting axed or morphing from onsite to online or vice-versa. Super inexpensive but what about the GPA being 3.0 for every graduate thing? is that even a thing? that's what I've read but haven't verified. i'm pretty sure that would be a non-starter for many post-master's NP programs. You might say my original question was intended to get people to read and respond more than anything. I'm just surprised by the lack of straightforward data? This school = this much $ (in-state, out of state, online, blablablah); like an excel spreadsheet. There's tons of this kind of info re: med programs, or even MBAs and what not.. Without getting into too much detail about my personal finances, I do know about loan repayment options. ; Some of which are applicable, most of which aren't. Thanks. I just found this ... UAB - School of Nursing - Tuition & Fees . Looks like the out of state tuition + the univ. tuition is quite a bit more than $18k though. Yeah, I've heard much about Frontier. They are one of the few programs that actually lay out their costs very plainly Tuition | Frontier Nursing University . From what I've read about Frontier it seems that even within the FNP program the emphasis is more on WHC; that could be an inaccurate assumption on my part. Also you have to set up are your clinicals yourself - probably the one really tangible benefit to more expensive programs like Drexel or Georgetown. They do offer tuition reimbursement. Although, the amount is relatively small. Maybe I should have rephrased my original question a bit. I'm aware that cheaper is not always the best; not unlike money does not always = quality (i.e. Univ. of Phoenix, just my opinion). I figured someone on Allnurses (or even Google) might have a something a more tangible list of actual tuition or cost-per-credit quotes at hand. Exactly. This is the type of response I honestly appreciate for all of about 8 seconds. I realize cost shouldn't be the TOP priority priority, which is why my original question takes up about 1/2 of a page. Boston, huh? So if you clicked on my link you might have seen how U. Mass (in Amherst) is right up there with err, well actually according to that specific list it IS the cheapest in-state tuition. The thing is, and I'm really not trying to sound utterly condescending or unappreciative of your feedback, cost is a deciding factor in where I can apply and in no small part because it wasn't such a concern of mine back when I was attending a very good (expensive) liberal arts school while earning my BA more than a decade ago; or whilst getting my BSN not too long ago as well. In fact, my disregard for mounting student loan debt is very much why I can't ignore the cost of any future NP school. I also understand this is where people might say, "Hey Nurse Oakley44, maybe lay off the whole idea until you finishing paying off your current mortgage of student loans then". I get that but if I were to be able to attend a school where I could actually kind of pay as I go, then I'd much prefer to do that; which leaves me to my original question. What is the cheapest NP (preferably FNP) program (that's recognized in all 50 states or at least CA) that you know of?? I really can't stress enough the fact that I've been researching this very concept on Allnurses before I even finished my BSN but, much like the salary/wage inquiry threads, most of these type of posts dissolve into arguments about the quality of one program or another w/o ever mentioning any kind of hard numbers. For example, I've come to realize, if $ weren't a real issue, I would've already applied to UC Davis here in CA a couple months ago, or Drexel Univ., or Georgetown. Again, thanks for reading. Thanks for the quick responses. The WGU concept seems to be more than just a novel ideal - thanks for the info. Of course, it opens up the natural follow-up question of where to get a post-master's cert. for FNP but, I suppose, cheaper is cheaper. :) But what's up with the grad. gpa of 3.0 for everyone? Isn't that a lil sketchy when applying to more competitive post-master's or DNP programs? Hey Folks, Yeah I'm actually asking this question seriously. So here's the thing: I've been an RN (w/ a BSN and a prev. Bach.) in the ER for 1.5 years. It's awesome. I thoroughly enjoy it, but it's a 2nd (okay 4th career) for me and I've always known I would want to continue to become an NP after a short (albeit reasonable) amount of time. That being said, I already have WAY TOO MUCH student loan debt to gladly rack up another $50k - $80k for an MSN or DNP. Thus, I ask of you: What is the absolutely LEAST expensive NP (preferably FNP) program you know of? I've done quite a bit of web-research. When you google this idea, usual the results look like this: http://www.affordableschoolsonline.com/online-nurse-practitioner-programs-charging-the-least/ Which is fine but not exactly definitive or accurate. 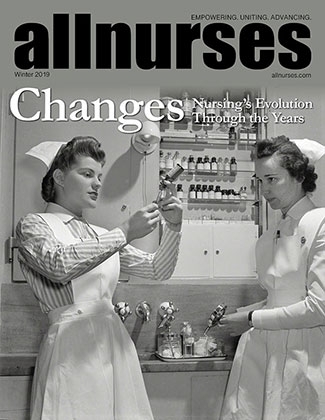 I've searched here on Allnurses about 40-ish times and read all kinds of dead-end threads from a couple years back. I prefer online or one with a strong online component but... I live in LA and having approval from the CA Board of Nursing is pretty much the only requirement. So what do you know folks? Annual tuition, total program cost, cost per credit? I need hard numbers please. Thanks for reading. ps. I know programs such as Frontier are very reasonable (about $30k) but it's also geared towards Women's Health NP (which is actually pretty cool, but just not really my thing). Yeah so that's not so true though. Several people have posted their basic pay rate information and along with rough geographic and specialty area info; data points which are especially informative when hunting for a new position in an unfamiliar area/state. I'm simply asking for people to stay on topic; as indicated in my previous post. Thankfully other posts following have done this quite well. Less about commutes and communities and more about what the op actually asked please.